Pros: The HP Velotechnik Gekko FX is currently the fastest trike to fold on the market. We are a big fan of the HP product, the quality is top drawer. The handling of the trike is spot on, the seat is comfortable and the seat angle is slightly adjustable. The Gekko FX is one of our favorite non suspended trikes. Cons: HP did such a grate job with this trike. We looked for some minor detail that we could knock them on and just could not find anything. We love the trike just the way we received it. Pros: This trike is really FAST. Recently before my review I have a friend who let me drive his Lamborghini Gallardo on the race track. I drove it as fast around the corners that my skill set would let me and pedal to the metal on the straight a ways. What an amazing experience, this is how I would sum up the the Catrike 700. The Catrike 700 is made USA, and is very height quality, welding is perfect and the paint is amazingly deep. Cons: The seat is low and the angle is way back, the seating position is designed for the few rather than the many. Pros: The Catrike Trail now comes with a new frame design which allow the seat angle to be adjusted. Catrike quality if workmanship has always been fantastic, welding if flawless and paint is extremely well dun. We have always liked the sporty handling by Catrike. Cons: We like Catrike and have always admired there design and workmanship. The only problem we have seen with there product line is trikes that do not fold. The good news is Catrike will have a folding version out some time in 2014. If you are look for a soft ride keep looking. 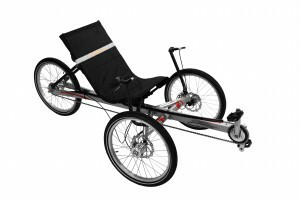 Pros: The Terratrike Rover is the number one selling recumbent in the world. With the Terratrike Rover’s high seat and low enter level price Terratrike has been able to turn a lot of people onto cycling. Cons: Non folding and only available in up to eight speeds. Pros: Terratrike fastest trike, the larger rear wheel and skinny tires makes the Sportster Terratrike’s most fun trike to ride. The Sporster frame is made of aluminum which was a noticeable lighter than Terratrikes other models. Pros: Incredible price for a good folding trike, available in 7 speed or 21 speed, we prefer the no flat fold so we can leave our bags on and fold the trike. Pros: Incredible price and value, the stowaway comes stock with most of the accessories that you would add anyway. Easily folds ( non flat) and very tight turning circle. Cons: We would have like to seen a bit higher quality items like the mirror, front light and rear light. Pros: Light for a Cro-Mo frame, above average seat comfort, above average ability to absorb road shock and a very adjustable angle seat. Pros: The Catrike 5.5.9 now comes with a an improved ride quality front the 26″ rear wheel and the new folding design make it more marketable to people who need to fold a triek fro storage ot transport. Cons: We were very pleased with the new Catrike 5.5.9. Pros: Fantastic quality, this trike will make you faster than you are on your current trike. Cons: The Aero is low and a lot of people will struggle with getting in and out of this trike. The neck rest is a must have because you are laid back so far.